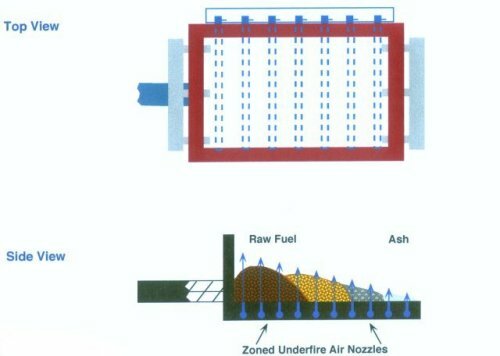 The Moss gasification combustion system can burn wet or dry fuels; however, this design is far superior to most others in the burning of dry wood fuel because of the way fuel is augured into the chamber and the way that underfire air is introduced into the grate assembly. Our gasifier design also helps prevent a "blow back" from occurring that may cause a fire in the wood storage facility. Safety in a dry fuel application is always a major concern for Moss design personnel. Not all combustion chamber designs can burn dry fuels safely. The gasifier design minimizes particulate carryover from the combustion chamber. 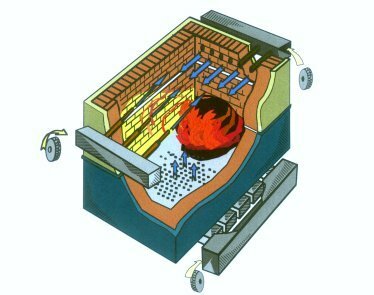 Our system provides superior combustion technology by providing large furnace volumes (generally 20,000 BTU/cu. ft. or less of heat release) with multi-zone grate underfire air, multi-port overfire air systems with high turndown capabilities powered by our superior combustion control system. The gasifier system can be installed on our HRT, firetube, watertube, hybrid and firebox boilers. The multi-zone grate underfire air system provides the flexibility to burn different species of wood from sanderdust to whole tree chips and from low (less than 10%) to high (55%) moisture content fuels. The convenient external hand valves allows for the proper amount of air to be distributed into the areas where combustion occurs inside the gasifier chamber. The total amount of underfire air is metered by a variable speed drive that is connected to the underfire air fan assembly and is controlled by the PLC. This unique design controls the underfire air throughout the combustion chamber, unlike other designs, such as the underfeed stoker which provides only a single zone of air. Our gravel grate system is unique to the wood industry and provides superior underfire air distribution to the fuel with minimum maintenance required. 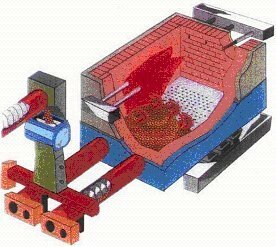 In addition to our gravel grate assembly for the gasifier system, we provide cast iron, refractory with stainless steel nozzles and refractory tile grate assemblies to meet your application and preference. 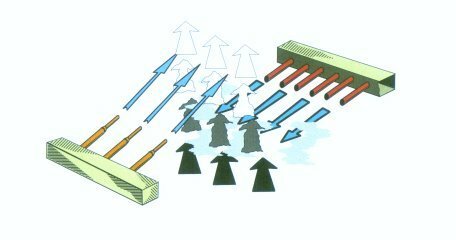 The firebox auger(s) gradually pushes the fuel across the multi-zone underfire air grate system promoting low bed turbulence. The objective of this process is to gasify the fuel on the grates without the wood becoming airborne and being carried into the boiler (sometimes sticking to the tubes) and up the stack into the environment. The multi-port overfire air system is provided for complete combustion. Our design provides total control of airflow and ensures low CO, NOx and particulate emissions. The overfire air system is specifically designed for each application. Our overfire air nozzle design covers the entire combustion system, burning gases and knocking down wood particles into the combustion chamber to be re-burned. A properly designed overfire air system can increase the steam production of the boiler while reducing particulate carryover and emissions.